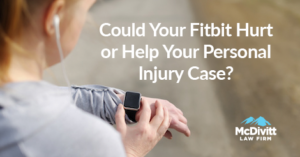 Could Your Fitbit Hurt or Help Your Personal Injury Case? Fitness trackers, like Fitbit®, are all the rage right now, and can be extremely helpful for someone getting and/or staying in shape. But can a Fitbit have another use? Well, according to an article in New York Daily News, some court rooms as seeing data from fitness trackers being admitted as evidence. In the particular case mentioned in the article, Fitbit evidence proved that a woman was lying about being assaulted, as her Fitbit revealed she had been awake and walking around, not sleeping when she was purportedly attacked. The article even mentions that in Canada, a woman tried to use Fitbit evidence in a personal injury lawsuit, to show that her physical activity has decreased since her car accident. But are there potential problems here? Certainly a Fitbit or other fitness tracker can show your activity levels, including, but not limited to, heart rate, blood pressure, traveling distances etc. You can use the data collected in comparison to previous physicality and current physical limitations due to your personal injury. However, as seen in the criminal case above, your Fitbit could be used against you. I’m certainly not insinuating that you hide information regarding your health. But, you should be aware that if data from fitness trackers are now being used as admissible evidence in court, you need to know that it has the potential of hurting your personal injury case, even if for some individuals it could offer helpful evidence. Think of the potential information gathered by your Fitbit to be similar to you posting information about your life on social media. You often post things thinking only your friends will see it, and forget that what you post may end up being seen by the insurance company. If information on your Fitbit can be gathered, why wouldn’t the insurance company want to look into that? Maybe your fitness tracker shows many more miles walked then you think. Many things can hurt your personal injury case, so please think about what your actions can do, while remembering the importance of documenting all aspects of your injury and recovery. Fitbits can be a great accessory and device, and we certainly aren’t opposed to them here at McDivitt Law Firm, but there’s always the potential that certain data may be harmful to your case, or may be helpful. You take the risk. But this shouldn’t stop you from being healthy and doing whatever exercises you need to help in your recovery after an incident like an auto accident. Remember, if you have been injured, please speak with your health care provider before taking on any athletic endeavors.